1. I never, ever wait for the oven to pre-heat completely. If I had to guess, I'd say I pop everything in around 220 degrees ... or however hot my oven gets within three minutes of me turning it on. 2. Amelia poops so many times a day that I got tired of schlepping the diapers to the kitchen trash can pretty early on. 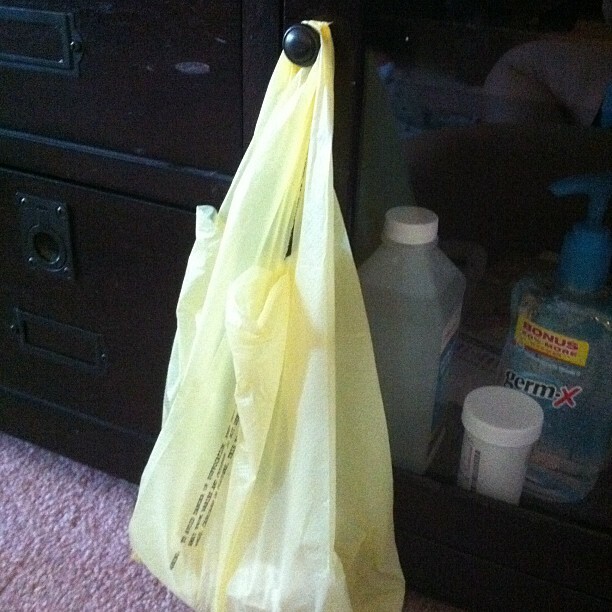 Now I hang a scented diaper bag on the media console in the den and drop the diapers in there all day ... then carry that bag to the kitchen trash can each night. 3. To get clean-shaven legs, I have to use the men's Mach 3 disposable razors for "tough beards." Those pink Daisy numbers just don't cut it. 4. I launch iChat roughly four times a day. I've never used it, mind you, but the Next Item button in Google Reader is right above it, so when I accidentally click too low on the screen, GAH. 5. I love yellow Laffy Taffy. Love it. I pilfered it out of the boys' Halloween baskets. You are not the only one that doesn't preheat the oven. Must run in the blood--the only Laffy Taffy I like is banana. It's so smooth in taste and texture, and the other flavors are too tart. Rachel, that is one of the funniest parenting techniques I've ever read! Diapers do pile up, don't they? I have a diaper genie, but I only put the dirties in there. The wets make a pyramid on Noah's changing table until I have an empty diaper container to put them all in. And I've used a men's razor for 12 years. Agreed.